A number of articles, studies and conference presentations have already described the great success of 3D-immersion brought about by VR and AR technologies in hundreds of classrooms in educationally progressive schools and learning labs. Considering that today’s museums are interactive learning environments that encourage engaging with material, VR and AR should be ideally placed to bring museum objects to life and create more dynamic, interesting exhibits and displays. The initial stages of the creation of our VR experience, VR:Cell, involved academic input, planning and concept development by Professor Matilda Katan from UCL Biosciences. Product development was made possible by two committed and eager-to-learn startups, The Body VR LLC and PlanetTechNews Ltd. The extensive testing throughout by about 30 members of staff from UCL Biosciences as well as by world leading VR experts from UCL Computer Science, Dr David Swapp and Professor Anthony Steed, provided valuable feedback used to improve the quality of both, the scientific content and the VR experience. Final testing involved UCL Public Engagement Unit and the Grant Museum. The experience was available on certain dates in Autumn 2016. 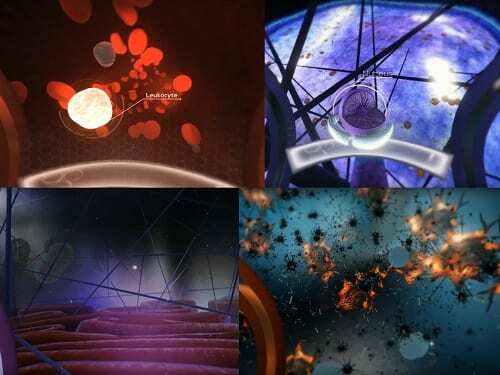 The actual VR journey takes the user into a typical animal cell. While traveling, the visitor is safely placed in a VR capsule with a pop-up screen that provides further visual explanations while the narration guides a tour of the cell structures and organelles as they appear in the surrounding environment. After surfacing out of the cell, the viewer can see how a virus attacks the cell. The journey takes 12 minutes with two earlier points that allow exit. The VR experience preceding the final version of VR:Cell, described as The Body VR, has been endorsed and released for free on several platforms (Gear VR, Oculus Rift and HTC Vive stores), translated into other languages and downloaded more than 300 000 times. We are extremely pleased with this reception on line but what about VR:Cell in the Grant Museum? 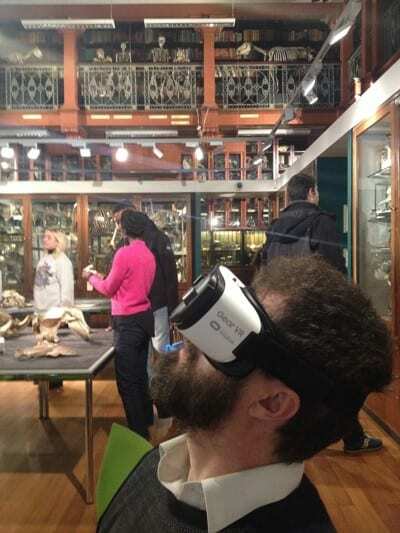 The reaction to VR:Cell at the Grant Museum was overwhelmingly positive – once people saw it they wanted to try it. Queues formed quickly at the sight of the obvious delight expressed by other visitors using the headset, as people snatched at thin air trying to grab parts of the virtual cell with big grins on their faces. Even parents were itching to try it after seeing their children’s reactions and, to our entertainment, behaved similarly to their children once they finally got to have a go! A staggering 98% of people stated that they would try virtual reality again and more than half of respondents stated that as an educational tool, VR is better than any other media, while the remainder believed it to add another way of learning. The majority of visitors agreed that VR:Cell was useful as both an educational tool and was suitable in a museum setting which shows that the general public not only recognise the potential of VR to explain scientific concepts, but highly rate it. Following our experience it is hard not be excited about the potential of VR to increase scientific engagement and learning in museum settings. Though a number of people that we talked to had already tried VR in school, at parties or marketing promotions and even have their own headsets at home they were still keen to try the experience again, showing its popularity. Although VR is new, it is already well established and familiar and it’s only going to get better. This pilot study has already shown the public’s interest in VR. It is clear that further studies to point out the strengths and challenges that VR may face, as a novel way to educate and engage, should be done in order to harness the full potential of this exciting new technology. Museums will be a very interesting environment to explore these growing technologies.